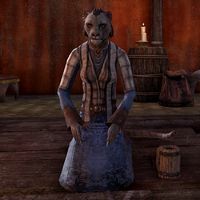 Daifa is a Khajiit reveler found at the ruins of Thormar. You'll find her with the Subtle Knife Members on the southeastern part of the ruin. After the completion of Box of Riddles, she'll greet you with: "The look on her face was priceless!" Why do you keep coming to the Boast? "Why does Daifa return if Aldeth keeps beating me, you mean? Pah. This one apologizes. She knows that faith in the Bandit is not always easy to understand. Just know that in crafting the prank, in trying, I show my faith to Baan Dar." This page was last modified on 13 May 2018, at 23:01.